October….is what I call “the month of everything.” This month is packed full of different types of awareness: Domestic Violence Awareness, Breast Cancer Awareness, Bullying Prevention, Substance Abuse Prevention Month, and the list goes on and on. Until recently I had no idea October is also Pastor Appreciation Month. When Josh and I decided that we needed to get back into church we “church shopped.” We knew that finding the right church for us was crucial. We attended several different churches to try to find the right one that fit our family. We finally found one that we all loved….even the kids. We feel so at home at Calvary Temple because of the people. More importantly we absolutely love the pastor and his wife. They make you feel like family and it is a wonderful experience. When we were dealing with our miscarriage, our pastor and his wife continuously prayed for us. We were, and still are, beyond grateful to them for that. Having a good pastor is crucial. Your pastor is your shepherd and you are his flock. He leads you in the right direction, feeds you with the Word, protects you, and comforts you. Until this point had you ever considered yourself a sheep? In the eyes of the Lord you are one person in your pastor’s flock. Crazy huh? The Lord sent pastors, preachers, and teachers to us to rescue us from our sin! Your pastor and the preachers/teachers in your congregation have the most responsibility that God can place on any individual person. Think about it….these individuals are responsible for their actions, what they minster to others, and for pastors….correcting the actions of their church/congregation. WOW! Talk about a huge load….that’s a lot for one person. 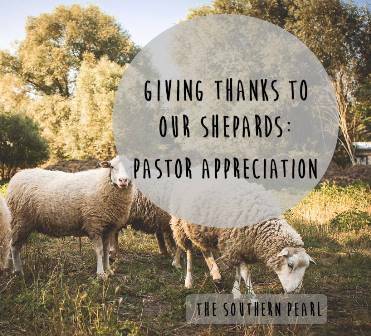 We often take our pastors for granted when really we should celebrate them all year-long! I hear of people who get mad/upset at something their pastor said during church that was just blunt and to the point. Why? He was sent to protect you, to lead/guide you, and to make sure you are living a Godly life. Why on earth would you want your pastor to tip toe around how you will get into Heaven? I sure don’t…..I want everything laid out in black and white. The more gray area there is…the more people try to live their life on the “edge” of what is acceptable Christian behavior. So when your pastor says something that you feel is rude or too straight-forward….remember his is trying to help you live the Godly life the Lord wants. A pastor only gets up and preaches and does a few things when it comes to the church, right? A pastor’s job is never done. Along with the happiness and success of their congregation, they have to carry the sorrow and downfall of the congregation as well. When you confide in your pastor about the things going wrong in your life…they feel your pain. When someone back-slides and leaves the church….the pastor mourns the loss of their soul. When they know people need to be in church and refuse to come, they long for them to be saved. A pastor is not only on duty Sunday mornings….they are on duty all day everyday. They work on God’s time not ours. So the next time you think your pastor has it “easy” think again! They have a far more stressful job than any of us could ever imagine…..being held in the highest regard by God, the Chief Shepard (1 peter 5:4). I want to give a HUGE “thank you” to all of the pastors out there….especially mine! You all are amazing! Do something nice this month for your pastor. Lord knows they deserve it!